Here’s are two beautiful seasonal displays featuring Mud Pie and C.R. Gibson. The white and gold make a strong statement and work very well together. It’s a rich combination up against the rustic brown accent pieces like the mantel and table. 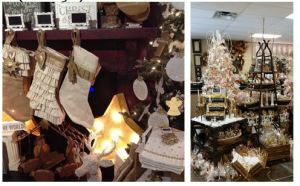 Sterling’s in Edmond, OK: Burlap is a huge trend in the gift industry and carries over to 4th quarter. The natural look of burlap partners very nicely with red and green colors in this display. 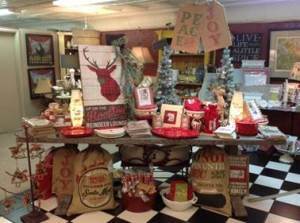 Pizzazz in Gulf Breeze, FL: Initial products are great gift giving items for the holidays. 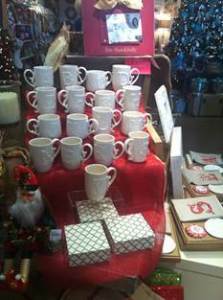 In this picture, the retailer is using Mud Pie mugs and are displayed them on a step tier up against a red cloth background. 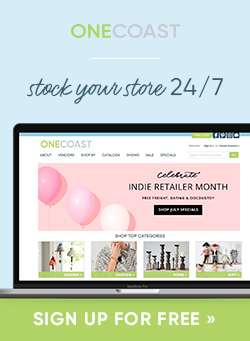 That pop of color anchors the look together and allows the products to stand out more. Casabella in Marietta GA (lower left) and Luxe Nest in Glenwood Spring, CO (lower right) Santa’s Reindeer are very popular this season. Check out these two great displays using Mud Pie and C.R. Gibson products for a clean, crisp look. The striking hits of red keep the total look balanced and eye-catching. 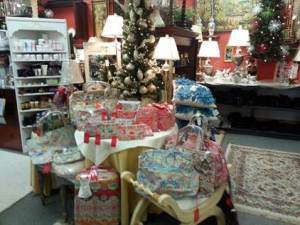 Mary Barnett Gifts in Norfolk VA: Here Oilily products are displayed within the store’s Christmas theme and demonstrates to the customer how Oilily can be the perfect gift-giving item. 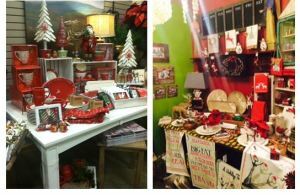 CLICK HERE to view a LOT MORE great holiday and seasonal display ideas from retailers all over the country! 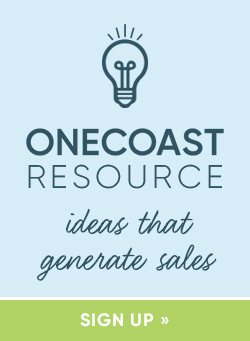 Share the post "Holiday Merchandising Magic from Around the Country"